Find my most current year's CD HERE. Every year for Christmas, our primary hands out a music CD as our Christmas gift. It contains all of next year's program songs plus an extra 2 songs for each month (36 songs total - 3 songs per month). I've gone through the 2014 outline and picked songs for each month that go along with that month's theme (a majority of the extra songs are found in that month's sharing time as suggestions). I figure a CD with only 8 songs is kind of a waste so I include a few for each month which I will eventually use as all my opening songs throughout the year. Once approved, I created a playlist using iTunes with these songs. I own all the Primary Songs on CD which I've uploaded to iTunes. 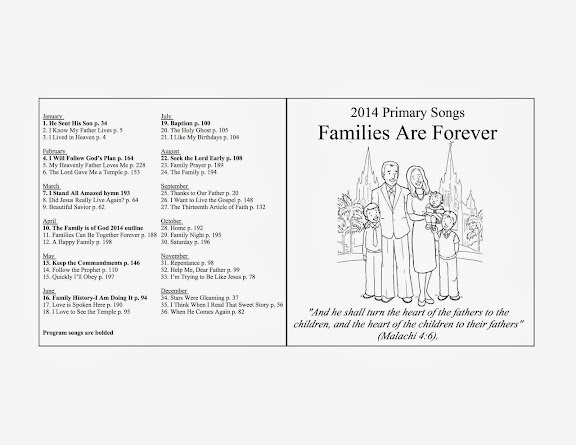 But if you don't own the CD, you can download all the songs in the Primary Songbook HERE, I Stand All Amazed can be found HERE and The Family is of God can be found HERE (make sure when you download, you right click and select "Vocals and Music"). I bought CD-R's from Costco (the huge stack will last for several Christmas gifts!) and the jewel cases from Wal-Mart which come in packs of 30 for less than $10.00. I keep the extra blank ones in the Primary closet to be used for future years. Then I started burning a million CD's! Once burned, I just took a Sharpie marker and wrote "2014 Primary Songs" on the actual CD. I did take a few random CD's and put them in my CD player to make sure they burned correctly. 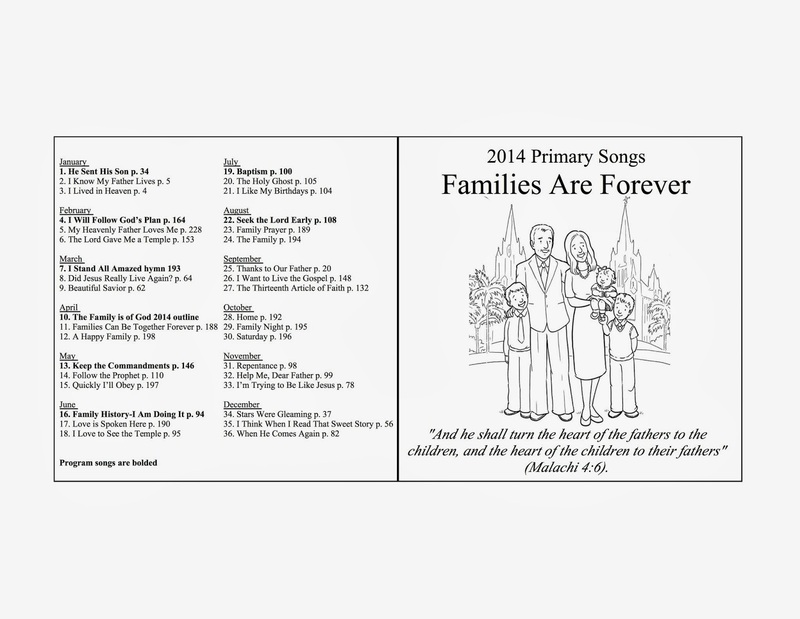 We give one CD per primary family. For our Primary it's about 30 so I've burned 35 to have as a few extras to keep in the cupboard just in case we have move-ins, someone loses theirs, or sometimes a few families ask if they can have another copy, etc. You can get the document HERE. If you want a blank one without the song list, it is HERE. To use the blank one, I suggest typing up a list that looks similar to mine (the font I used it just Times New Roman), cutting it so it will fit within the square and taping it on. When you make photo copies, you will never know that you literally copied and pasted. I do like the black and white cover only because I make copies at the library and they are free. I also tell the kids they are welcome to color their CD cover to make it more personalized. The artwork I chose is from the 2009 August Friend HERE. I appreciate that it is already church-approved material. But there are several really cute ones...I saw one posted on Facebook HERE (you have to be a member to see it) that was way cute too! Once I have my copies made, I cut around on the black lines with the exception of down the middle. I fold it there and simply slide it into the cd jewel case. The presidency ties a Christmas ribbon around them and attaches a treat of some sort for each child (suggestions? one year we did Ring Pops and put "ring in the new year with music" - something catchy like that again would be wonderful!). So a family with 4 nursery/primary kids would receive one CD tied with 4 treats and a little tag. We'll pass these out the Sunday before Christmas. And that's that. Pretty simple and nothin' fancy but if you know me, you should expect that ;). So, do you actually teach 3 new songs every month? Or is this just for something for them to enjoy along those theme lines? No, I don't teach 3 new songs each month - I'm not that crazy ;). We'll sing the other songs as opening songs during the month, however. Thank you!! I just wanted to add that we give a CD to each teacher as well (many of ours don't have primary aged kids) so that they can be familiar with them as well. No. That's one reason they have everything downloadable. The only ones that have copyright issues are the ones they don't allow you to down load OR copy. Generally, unless noted, All church materials are available for copy and distribution - but obviously not for profit! You make it sound so easy!!!!! I just can't seem to get it to work so well! Are you local to me? I'd pay you to make ours for us! none of my presidency knows how to do this!!! Thanks for commenting - my thoughts exactly. I figure if you can download all of these songs for free form the Internet, there shouldn't be any problem putting them on a CD. Plus, all the songs in the songbook (with the exception of a few) say they are available for home and church use. If you want to send me a personalized email so I can get your email address, maybe we can figure something out. Just click on the "Contact Me" tab at the top and shoot me a quick comment. Thanks! Super awesome! Thanks for all the work you put into this! I'm having trouble getting "The Family Is Of God". All I get is a woman speaking the words. There is no music or singing. Help! Scroll down and it should hopefully work. It worked! Thank you so much for responding so quickly! You're amazing! Camille you are amazing! I am now the primary president in our ward in Indianapolis and our primary chorister directed me here for our Christmas cd's and I just barely put two and two together that you are you. Ha. You were our Primary Chorister in the Sierra Verde ward in AZ before you moved. Man am I glad to have access to all your ideas! (and I'm glad our chorister uses your site too!!) Thanks a million times for sharing! Hi Becca!! Thanks for saying hi, great to hear from you! I'm glad my information is reaching Indiana - how fun for you guys. I hope you are doing well! Yes, still chorister - by total choice. I never want to leave this calling. I'm sure you are an amazing primary president ;). Your house always had so many fun things going on with your kids. Take care! Hello, I just stumbled upon this site and think you have some great ideas. I was just called to be chorister and stuff like this helps SO much. In our ward a number of people have asked that we create an online playlist that they can download to their phones or ipods or what have you. Would you mind if I publish all of this to my personal site in a playlist form (either with links to the specific songs or uploading them to my site) and a zip file with all of the music? I will give credit back to you for the concept and you are welcome to send people over to download. I will wait for your response. Thanks! Hi Aaron - thanks for your nice comments! Please pass along any information you find from my website. I'm ALWAYS happy to help! Is there any way you can post your document in word form so it can be editable? I'd like to adjust a few songs (choice songs for May & June, etc) and it would be so nice if all I had to do was change a few lines, instead of starting from scratch. Thanks in advance! I would love to have your documents in Word form as well so that I can change a few songs to fit our Primary. I didn't create the form in Word otherwise I would totally have it posted. I used MDS (a scrapbooking software) so if I emailed you the editable file, you wouldn't be able to open it unless you have the same software. Sorry I'm not more help! This is great, it is getting used in Maryland. Thanks! This is Great! Thanks! We in Montana are so grateful for you time and effort! Camille, have you started on your 2015 CD? This is such a wonderful idea, and thank you for sharing it with us. I've been waiting for the physical 2015 outline to be available at the Distribution Center but it's still not released! I just like to mark it all up to help me with my song choices - but I may resort to just using the online version. I've also got my song selections submitted to my Primary President. Once I get the go ahead from her, I'll get going on my CD song list, which hopefully will be in about a week!